The English Language Fellow Program partnered with Sistema Avanzado de Bachillerato y Educación Superior (SABES) and the Benjamin Franklin Library (Mexico City, D.F.) to facilitate a cultural art exposition at Bachillerato San Pedro de los Hernández, a participating SABES high school in León, Guanajuato, Mexico. 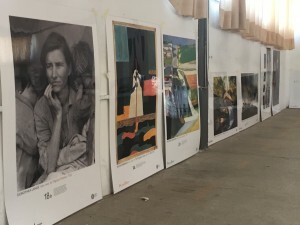 The featured artwork is part of the Picturing America series, which was created by the National Endowment for Humanities and donated to SABES by the Benjamin Franklin Library and the Regional English Language Office in Mexico City, Mexico. The exposition was unveiled in the courtyard of Bachillerato San Pedro de los Hernández. English Language Fellow Rosa David and Regional English Language Officer, Frances Westbrook were present for the opening ceremony along with SABES Superior Director, Alejandro Carretero and Superior Academic Director, Rocío Sanchez Valencia. The exposition provided SABES high school students with an opportunity to learn about American culture through a vibrant presentation of artwork. The exposition inspired English Language Fellow Rosa David and SABES English language teacher, Aracely Anguiano Vazquez, to develop a month-long cultural exchange project that would promote a mutual understanding between the United States and Mexico. SABES students were assigned to describe different pieces of artwork and explain their cultural significance to both American and Mexican history. The students shared how each of the different pieces shaped their understanding of the cultural similarities Mexico shares with United States. This project expanded the cultural competence of the SABES students and helped them to make deep connections between American and Mexican History, noting the shared historical identity, culture, and customs of both countries. “I believe one of the greatest gifts we can give our students on both sides of the U.S./Mexico border is the ability to understand that though we may come from different geographic regions, we have many similarities that make us citizens of a global society. Somos Americanos,” said David.